How do you use up all your empty tin cans? From beans to soups and even dessert, there are so many great foods that are packaged inside tin cans these days. You probably already know that they can be recycled pretty easily, but perhaps you didn’t know that upcycling them can be just as simple. 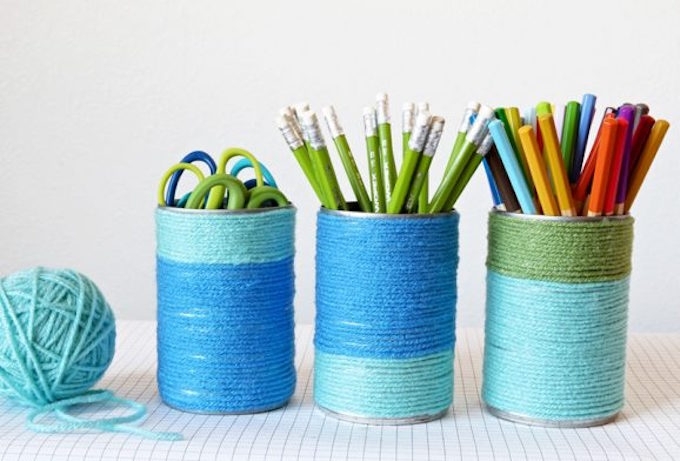 Crafts, storage solutions and even utensils – there are so many uses for tin cans that mean you’ll never want to throw one away again. Here are 16 of our favourites. How fab do they look? How do you expect to get work done with a desk that messy? The solution doesn’t have to be an expensive organiser, as you can make your own from tin cans. How far you go with this is entirely up to you. You may wish to just use one can and leave it bare for a ‘rustic’ look, paint/cover the outside, or even use several cans, cutting them into different heights and making a set of organisers – the choice is yours. Paging Supermum had a really nifty idea of wrapping hers in wool. It’s super simple to do, but highly effective – the cans are truly unrecognisable! Have you got some really pretty plates that would look great with a cake sat on top of them? Using a can, you can build your own, DIY cake stand to hold all your delicious treats. Paint or decorate the can to be in keeping with your plates for maximum effect. Cookies are delicious, there’s no doubt about that, but in order for them to look as good as they taste, you’ll need a cookie cutter. If you don’t have any lying around, a quick life hack is to use the open end of an empty, washed tin can to punch circles into your dough. It’ll do the job of a cutter, without you having to buy one especially – genius! There’s nothing that winds me up more in the morning than not being able to find what I need in my messy drawers. You can save time searching for things by using tin cans to organise your drawers. Cut them down to the desired size, and fit them inside your drawers. If you want to prevent them from sliding around, a piece of Blue-tack on the underside should do the trick. Cut them down to the desired size, and fit them inside your drawers. If you want to prevent them from sliding around, a piece of Blue-tack on the underside should do the trick. Andy Warhol’s, Cambell soup art work is so unique, and has a distinctively retro vibe. If this is something you like, you can bring a touch of this vintage look into your own home with the help of some retro looking tin cans. The Young Austinian uses a variety of shapes and sizes to make hers – check out her tutorial for some inspiration. Guests coming round? Time to get the snacks out. The question is, where to put the breadsticks? Bowls are too low, glasses too narrow – the perfect solution? Use a clean tin can. Again, you can choose to cover these in a spotty material, patterned paper or paint them to make them more aesthetically appealing. There’s no need to buy gift bags especially if you’ve got some tin cans lying around. With a bit of decoration, these make ideal containers for thing like sweets, chocolates, socks and other small gifts, ideal for birthday treats or even wedding favours. Lanterns have become a big trend over recent years – why not upcycle some of your empty tin cans and get making your own? Drill small holes in either side of the can to attach a wire for hanging, and pop in a large candle. They make the perfect outdoor accessory, especially when tied with ribbons or painted in vibrant colours. If you sew, you’ll know there’s no such thing as having ‘too many pins’. Keep them stored neatly and always on hand by crafting a DIY pin holder. A low can, such as a sardine, spaghetti or tuna can, is best for this purpose. Practically Functional chose some really vibrant colours for hers, and the results are amazing! Check out her tutorial to learn how to make your own. Centrepieces needn’t cost a fortune. In fact, using some old cans, extra bits and bobs and a bit of imagination, you can create something perfect for a Wedding or party on a budget. Gold spray paint is really effective to help add glamour to this everyday item, and raffia adds a soft touch to this sturdy item. Pop your favourite flowers inside for the final flourish. Always wanted one of those hanging storage systems from IKEA? Well, with the help of your tin cans, DIY-ing your own has never been easier. All you need is a rail put up on the wall, some metal hooks and some tins cans. Drill a hole through each of the cans, wide enough to fit the hook through, and then hang them onto the rail – done! Wall storage really is a great space-saving solution for small kitchens, keeping everything accessible without cluttering counter space. I love a good village fair, but they’re a rarity these days. Playing games on the internet may be the way most kids have fun these days, but there’s still something to be said for old school classics, like tin can bowling. This is especially great for little ones, as they’ll not only love playing the game, but you can get them involved int he decorating process of the cans too for a fun-filled day of activity. The finishing touches on this make it really stand out. There’s nothing like enjoying a BBQ outside on a sunny, summers day. Taking everything outside, however, can be a bit of a pain, especially if there’s a lot of you. 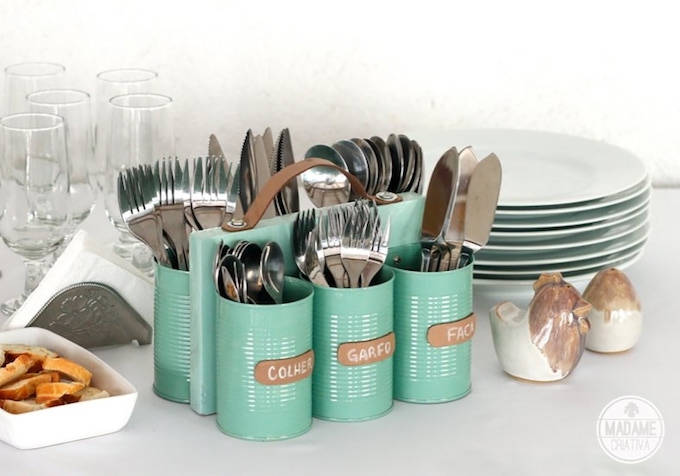 A cutlery holder can provide the perfect solution, and you can make your own at home, from tin cans. Handimania features a tutorial all the way from Brazil which is super effective, but really easy to do. The tins are attached, making them much more convenient to transport – p.s, it’s pretty too! Ribbons can add a fabulous flourish to any present, but where to store them? Place the ribbon inside, and create a hole in the side, big enough for the ribbon to slide through, then pull the ribbon through. Can you believe there are cans hiding inside of there? Now this one really is good: A Beautiful Mess are always amazing at transforming old, everyday objects into stunning things, but they’ve really gone all out this time. 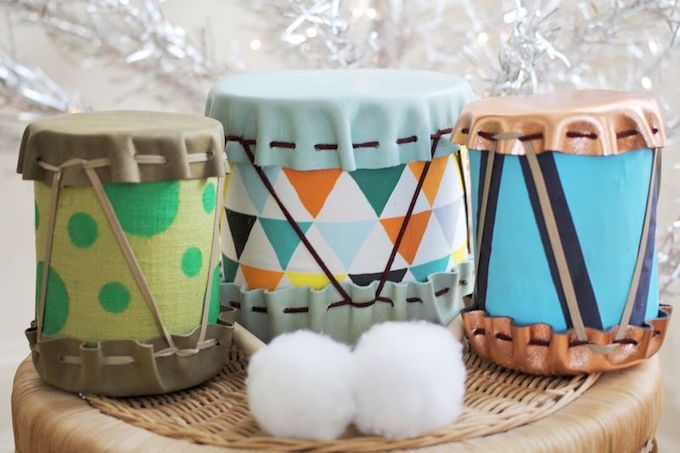 Taking their old cans, they’ve crafted some DIY drums, perfect for little ones. The tutorial is very easy to follow, and the results are so so pretty that it’s definitely worth the effort. Whether you want to keep animals away or just add a splash of colour to your outdoor space, a can wind chime can be the perfect solution. The metal material means they’ll make a gentle, tinkling noise and they’re hardy enough to last for ages. Even more space for wine – great! Are you a wine lover? If so, you’ll love this idea. 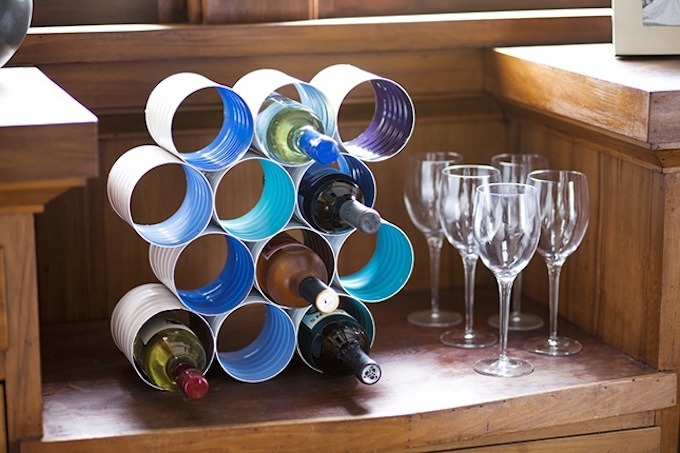 Tin cans are the perfect size for storing your wine supply. The dimensions of the cans also mean more cans be added over time, so you’ll never run out of space, no matter how much your passion for wine – or drinking it – grows.